Metropolitan Kansas City has become one of the few national centers of transportation, communication, distribution, finance, commerce and technology. To take advantage of this prime growth environment, Block Real Estate Services, LLC (BRES) has created Pine Ridge Business Park as Kansas City's most prestigious mixed-use business park. In the heart of Johnson County, one of the fastest growing counties in the United States. Distinctive and aesthetically pleasing earth-tone architecture are in line with the high standards of Pine Ridge Business Park. Some of the most respected firms in the country have chosen Pine Ridge Business Park for their business locations because of the quality of development and the overall standards continuously adhered to in the Park. Architecturally significant office buildings are successfully integrated with office/showroom, office/warehouse, high technology, and warehouse uses. Companies desiring one location for a combination of these space types can do so at Pine Ridge Business Park. 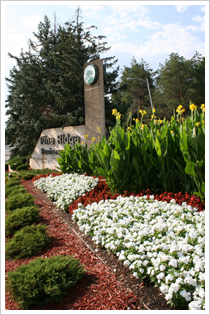 By preserving the natural terrain with prairie grasses, green belts, rolling berms, magnificent pine trees, and numerous landscaped flower beds, Pine Ridge Business Park harmoniously blends office, high-technology, light industry, distribution, and research-minded companies in a master planned business park within the Metropolitan area.